As caroling, hot chocolate, and cold weather begin to emerge, we begin to look forward to holiday joy that is soon to come. 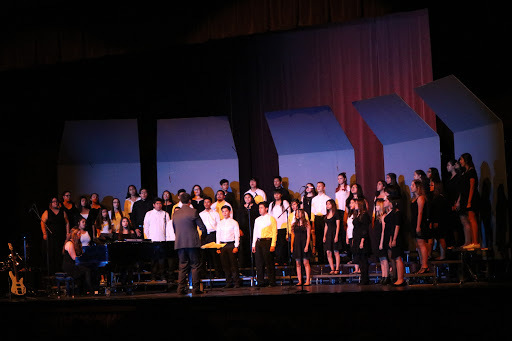 Recognizing the hard work students have put in, especially through music during this spirited season, it is exciting to see the RHS Choir program working hard to bring spectacular performances to their audiences. As the Christmas season approaches, there are many great events that each group is preparing for, and lots of Christmas cheer to look forward to! Under new instruction from Choir Director David De La Concepcion and returning accompanying pianist Corey Dobbins, lots of exciting things are in store for the season. 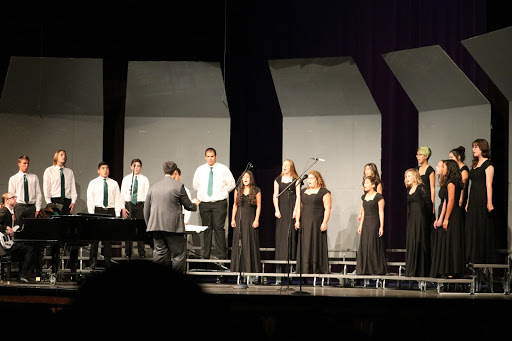 This year, the various singing groups on campus include: Concert Choir, Madrigals, and Mixed Choir. Currently these energetic groups are dedicated to bringing all they have to their upcoming Christmas show. In class, students do various activities, but mostly, of course—sing! These activities help them develop different technical aspects of singing, their performance skills, and their relationships with their peers, strengthening their bonds as a group. With physical and vocal warm-ups at the start of each period, following a section of musical skill building (such as sight reading or other musical skill development), they finish their class with concentration of their repertoire. However, the most important thing they do, says Concepcion, is have fun! The Christmas performance will include classic holiday favorites, traditional carols, and new music for the crowd to enjoy. Concepcion adds, “Students have been working very hard for this performance and are eager to build on the success for the winter concert!” Definitely not one to miss. This show will be held at Reedley High School’s performing arts theater on Wednesday, December 6 at 7:30 p.m. for free, however donations are always appreciated. This performance will also include the Orange Cove Concert Choir, another group Concepcion teaches. Jovanna Servillo, a Concert Choir member, says, “I love the wide variety of songs and am excited for the Christmas performance, especially with such a good selection of music this year.” Salma Lopez, a member of Madrigals, states her experience has been amazing so far and has helped her develop her skills as a musician. She expresses cheerfully, “I am extremely excited about the Christmas performances, and I’m looking forward to showing the audience what we’ve been working on!” Lopez states that her time in choir has inspired her to pursue music in the future and major in it in college. This is just one of the great performances the groups have coming up. The talented and renowned group in the community, the Madrigals, who consist of the top singers, have many exciting shows of their own that will take place throughout December. This small and vibrant group of wonderful students are performing at many of the Hillcrest Pajama Nights and at the Reedley Community Center for Toys for Tots on Thursday, December 21. Coming up later this year are the Cal Poly San Luis Obispo Choral Festival involving the Concert Choir and the Form Festival involving Madrigals at Disneyland. Also, looking forward to February, Madrigals are currently taking reservations for Singing Valentine’s Grams. On February 13 and 14 the Reedley High School Madrigals are available to serenade your special someone for $25! They can travel to locations in Reedley, and surrounding areas/towns. Corey Dobbins, the choral accompanist for all the choirs and a percussion tech for the Reedley High Marching band, says that it is a busy time for choir. His favorite part of his job is “seeing young people overcome obstacles and better themselves.” He graduated from Reedley High and has worked for the KCUSD district since 1997. David De La Concepcion, beginning his first year in the district, says he is enjoying every bit of teaching choir at RHS, and adds, “I love that I am able to sing and make music every day! It’s amazing to see the progress that students make throughout the course of a year or preparation for a concert. We start with different pieces of music, and with students at different musical ability levels that contribute to making an amazing sound and music. I also get to form relationships with students and help them grow as musicians. My favorite part about choir as a student was not only being able to make amazing music but all of the life-long friendships that were created! This is what I hope to provide my students.” Concepcion has worked in music at other schools, a theater technician, tutor, and has been involved in a variety of other musical gigs. With the many fantastic performances coming up this holiday season, please come out and support the RHS Choir! Once again Brissa GREAT ARTICLE!! I am so proud of you !! Keep up the good work and I am looking forward to reading your next article.